As Women’s History Month comes to a close, I find myself thinking about the limitless potential that exists when women are fully embraced in our community. It’s imperative that women inspire, encourage and empower one another. Melinda Gates said, “When women and girls are empowered to participate fully in society, everyone benefits” and I agree wholeheartedly. 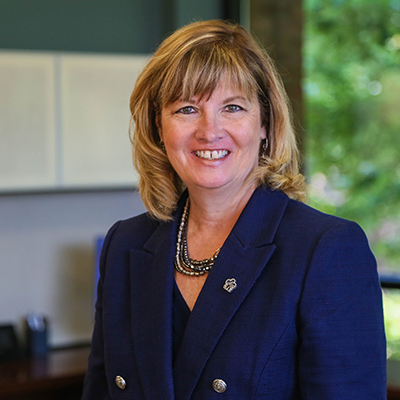 I’m proud to serve as LCCC’s first female president, and it’s important to me that women in our community feel connected, supported, and prepared to reach their educational and career goals. It’s my mantra that every student’s dream matters, and it’s our mission at LCCC to help each student achieve their goals – no matter the barriers they may face. As the community’s college, we serve students of all ages and demographics, and we prepare them for the next phase in their lives – whether that’s retraining for a new career or transferring to a four-year university through LCCC’s University Partnership or another institution. The strength and determination put forth daily by our students is truly inspiring. But even the most resolute student can run into roadblocks, and that’s where LCCC’s specialized networks and support programs can inspire and energize students – especially women who often face unique challenges. One program that is inspiring students to reach their goals is our Students Accelerating in Learning (SAIL) program, which is producing amazing results for all participants – including women of all ages. Our ground-breaking SAIL program is modeled after the highly successful ASAP program at The City University New York. LCCC’s SAIL provides financial support in the form of tuition scholarships, textbook vouchers and gift cards for gas and groceries. Moreover, students are supported each step of the way through regular communication with their advisor. Many of the students are women from low-income households and are the first in their family to attend college, making the SAIL program a tool to break the cycle of poverty. There is no doubt that the combined impact of monetary support and advising is effective and SAIL’s results speak for themselves. Over a two-year study by the nonprofit research firm MDRC, students in LCCC’s SAIL program graduated at more than twice the rate of students not in the program. (Read more about our results and find the full case study here.) This swift path to graduation – with more than 41 percent of SAIL student completing a degree in three years – is worth expanding and LCCC is committed to doing just that. Over the next five years, 1,000 students will benefit from the SAIL program. This expansion is focused and deliberate. We know that educational attainment has a profound effect on whether a family lives in poverty, particularly for those with a high school diploma or less. A college education can be especially transformational for single mothers with young children, who often bear the brunt of poverty. Of all the families in Lorain County with children under five years old living in poverty, 61 percent are headed by single moms. By reaching these populations through strategic programs like SAIL, we give women and their children the power to move up the economic ladder, creating a vibrant future for their families and our community. One inspiring student to complete our SAIL program is Dorisa Johnson. Dorisa started walking to the LCCC Lorain Learning Center when she was 18. She had earned her GED – the first in her family to reach that milestone – and was hungry for more education. She felt a calling to study for a career in heath care as a tribute to her father, who passed away in 2014. At LCCC, Dorisa found SAIL and the confidence that she could achieve her goals. She also found a trusted advisor and confidante in SAIL advisor Cynthia Arredondo. With that support, she earned an associate of applied science in medical assisting from LCCC in 2018 and is now on her way to a bachelor’s degree from LCCC’s University Partnership. Dorisa Johnson is on her way to a career in health care. Dorisa was steadfast, but like most students, she faced challenges. The SAIL program prepares students to weather storms through a built-in support system at LCCC. For Alyssa Earl, the requirement to enroll full time almost stopped her before she got started. This requirement is in place because we know that students who enroll full time are more likely to earn their degrees faster. Alyssa was working full time and not sure she was able to prioritize school. Like Dorisa, Alyssa turned to her advisor, Cynthia Arredondo for advice. Arredondo said Alyssa’s struggle to put education first is a common dilemma for the many women she mentors through the SAIL program. Arredondo encourages and inspires fearful students by sharing the stories of the many strong women who completed their degrees while also balancing other responsibilities. Regular communication is also a priority, she said. Alyssa earned her associate degree in 2018 and is now working on a bachelor’s degree in psychology through LCCC’s University Partnership. Without the push from her advisor, Alyssa said she would have taken one or two classes per semester, dramatically lengthening the time it took to earn her associate degree. Alyssa Earl is the first in her family to earn a college degree. She’s now working on a bachelor’s degree through LCCC’s University Partnership. When students are inspired and encouraged, they become empowered to reach for their dreams, like SAIL graduate LePreece Johnson. 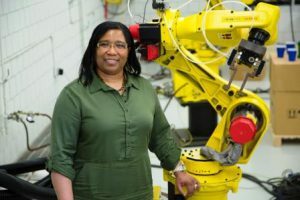 LePreece was in her mid-40s when she decided it was time to leave a successful corporate job and follow her dreams toward a new career in engineering. With five children and a husband, LePreece struggled at first with allowing herself to focus on her education. It was the financial assistance of SAIL that helped her put aside her doubts. “Knowing I had tuition covered helped me sleep at night,” she said. LePreece Thomas left her successful corporate job to follow her passion for engineering. She found her place with LCCC’s SAIL program. 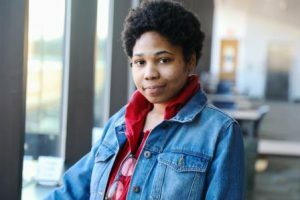 LePreece earned two associate degrees in May 2018 and is now working in her dream career as a project coordinator for Mainthia Technologies, a contractor for NASA – a job she was landed before she even graduated. LePreece, Alyssa and Dorisa were inspired, encouraged and empowered to build a strong and positive future for themselves. They are now doing their part to inspire others – including the next generation who can look to these women as strong examples of what can be achieved when we support one another. It’s Women’s History Month, and I want to know: Who are the women that inspire you?